I posted this back when I started the blog, but I didn't take a picture, so it didn't get the attention it deserved.. But believe me this is one gorgeous meal! 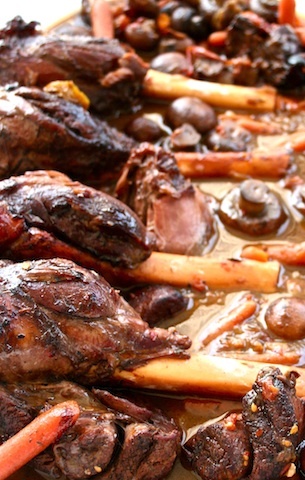 I just love when lamb falls off the bone, there is nothing like it.. And don't worry about the long list of ingredients, this dish is quite simple to do, and will certainly make an impressive statement at your table.. In a small bowl, mix the olive oil, thyme and honey.. Rub the lamb shanks with the paste and then season them generously with salt and pepper.. Put them aside, heat a large pot (cast iron if you have) and add a little oil.. Brown the shanks nicely on all sides and set them aside again.. Add a little more oil to the pan and fry the onions until golden brown.. Add the tomatoes, carrots and the brown sugar, then place the lamb shanks back in the pot.. Now add the chicken stock, juice and season with salt and pepper.. Bring everything to a rapid simmer, then close the lid and put the pot as is it is in the oven for 1 1/2 hours.. Then add the mushrooms and the chili (if you wish), and braise for another hour or so.. When the shanks feel soft and tender your beautiful meal is ready to be served (total time in the oven is about 2 1/2 hours).. Bon Appétit!